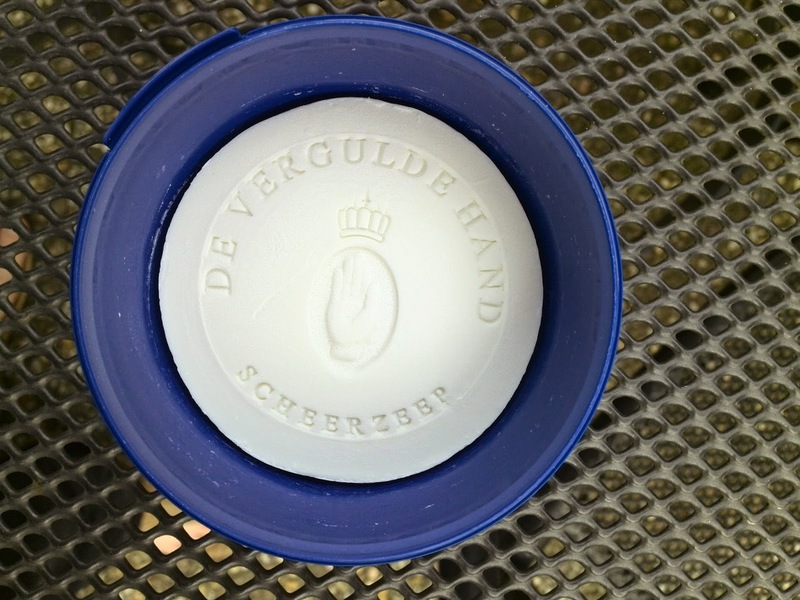 De Vergulde Hand is the most famous and oldest Dutch shaving brand that still has the classic shaving soap for sale. De Vergulde Hand is next to the oldest Dutch shaving brand also probably the oldest registered shaving brand in the world, namely 460 years old. De Vergulde Hand seems to be quite popular among foreigners and people are apparently willing to pay three times so much for it. I must confess that I have difficulty to understand why this shaving soap is so popular among foreigners. By the way De Vergulde Hand is translated in English to The Gilded Hand. De Vergulde Hand Shaving Soap comes in a small cheap plastic tub containing the shaving soap puck. 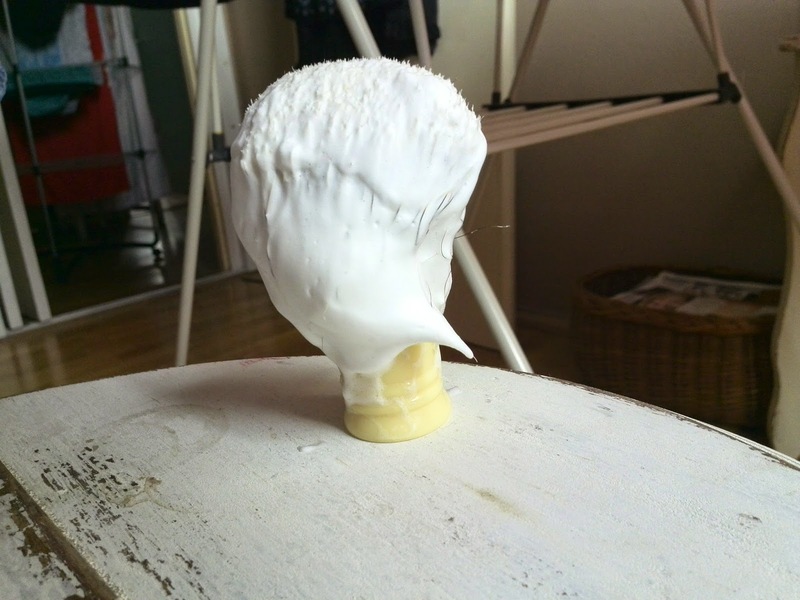 I personally think the packaging of De Vergulde Hand is very practical to use, and it is also very easy to load the shaving brush full with shaving soap. I also find that the packaging has quite a retro look, and I personally find that nice. The most beautiful thing about the shaving soap I think is actually the fancy-looking logo, and in a wooden shaving soap bowl that also looks very luxury. I personally find the performance of this shaving soap average and shaving soap is easy to whip into a thick rich lather, and a shaving brush fully filled with lather enough for three passes. The quality of the lather is basically good and also doesn't dry on the skin, and also makes sure that the safety razor can glide smoothly over the skin. However during the shaves I noticed that the lather doesn't protect the skin good, and I think this is a very important feature a lather should have. The scent is best described as a classic fresh soap scent with a hint of citrus, and personally I find the scent doesn't smell old fashioned and perhaps it is precisely the scent why De Vergulde Hand is so popular among foreigners. Remark group the company behind De Vergulde Hand does basically not export De Vergulde Hand outside the Netherlands. However some vendors like West Coast Shaving sell it for $ 7,99 and you can always ask a Dutch guy like me. 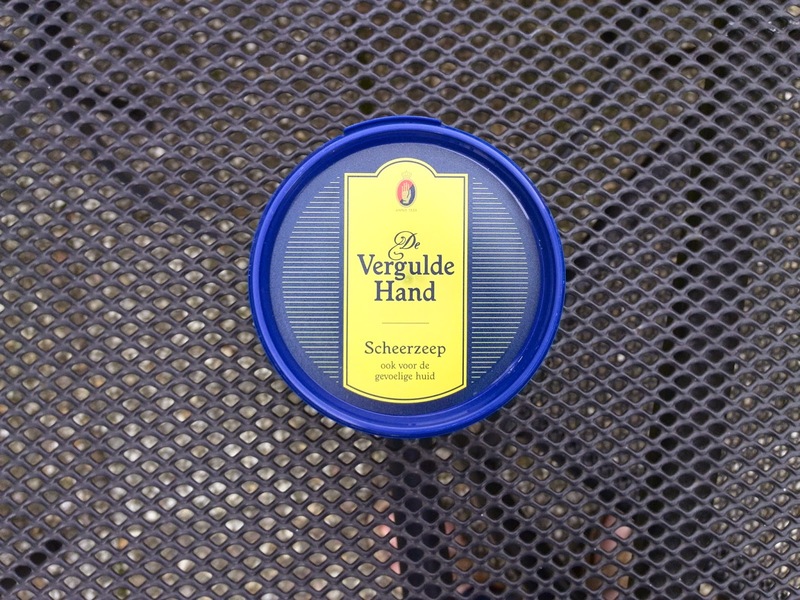 In the Netherlands De Vergulde Hand is sold for € 1,79 in drugstores and supermarkets, and sometimes there is a promotion for De Vergulde Hand. I personally consider De Vergulde Hand Shaving Soap as an average shaving soap, and that is mainly because this shaving soap doesn't protect the skin good during the shaving. Despite the inferior performance of this shaving soap, I still think De Vergulde Hand Shaving Soap offers a good value mainly because its a long lasting shaving soap.